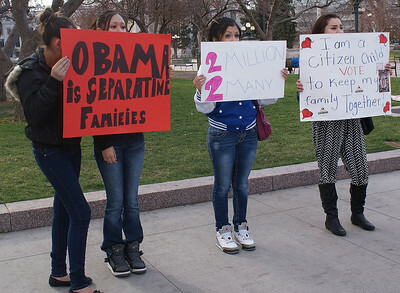 Young hispanic woman holding stop sign shaped poster against deportations, other with signs beside her. 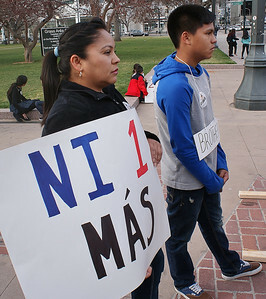 Hispanic woman with "Ni 1 Mas" sign at protest against deportations. 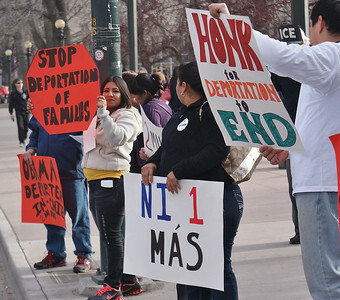 Woman holding stop sign shaped poster calling for end to deportations. Four young women hold signs criticizing President O'Bama's deportation policies for separating families. 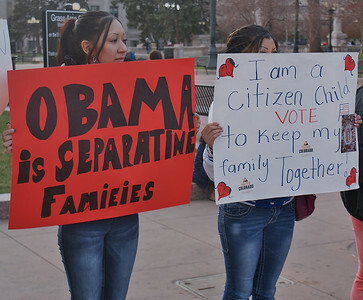 Two young hispanic women hold signs criticizing OBama's deportation policies for separating families. 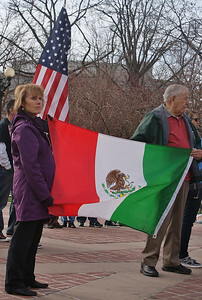 Man and woman hold large Mexican flag at immigration reform demonstration, another person holds American flag behind. 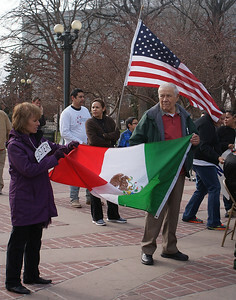 Man and woman hold large Mexican flag at immigration reform demonstration. 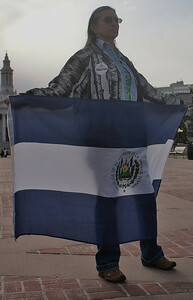 Woman holding Salvadoran flag at immigration reform rally. 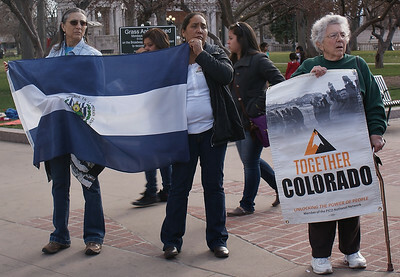 Senior woman holding sign at immigration reform protest, flanked by two other women holding large Salvadoran flag. 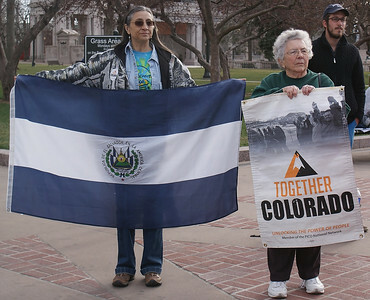 Senior woman holding sign at immigration reform protest, flanked by another women holding large Salvadoran flag. 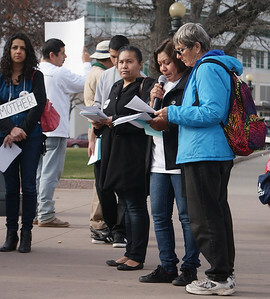 Man speaks using microphone at immigration reform rally, sign in English and Spanish in front of him, Colorado State Capitol building behind him. 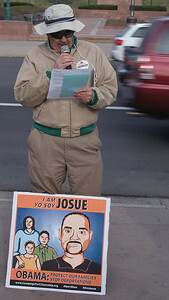 Man speaks using microphone at immigration reform rally, sign in English and Spanish in front of him. 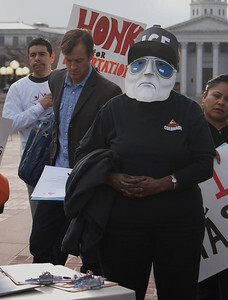 African American woman wearing "ICE agent" mask at demonstration against deportations. Hispanic woman cries while speaking at demonstration against deportations. 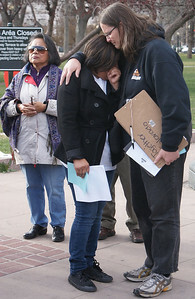 Woman crying after speaking at protest against deportations, being consoled by another woman whose arm is around her. Group of hispanic men and woman hold large cut uot numbers designating 2 million people deported. 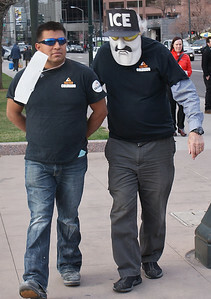 Man with anti deportation sign being "arrested" by man in "ICE Agent" mask during skit at protest against deportations.